Today during a special media event, Apple unveiled its next smartphone, as expected. Pricing is unchanged from previous models: $199 (16GB); $299 (32GB); $399 (64GB). iPhone 4 is now free and the 4S $99. All prices are with contractual commitments. Apple starts taking preorders on September 14 and shipping one week later in Australia, Canada, France, Germany, Hong Kong, Singapore, United Kingdom and United States; in 22 more countries on September 28.
iPhone 5 features a 4-inch display with 1136 by 640 resolution and 326 pixels per inch. The handset is 7.6mm thick -- that's 18 percent thinner than its predecessor -- and 20 percent lighter at 112 grams. The new model marks the first major change in display size since the original launched in June 2007. Apple packs in an A6 processor, bumps the front-facing camera to 720p and improves the rear-facing 8-megapixel camera, which now -- in a catch-up feature to Galaxy Nexus -- includes a panorama shooting mode. Aperture is a respectable f/2.4. 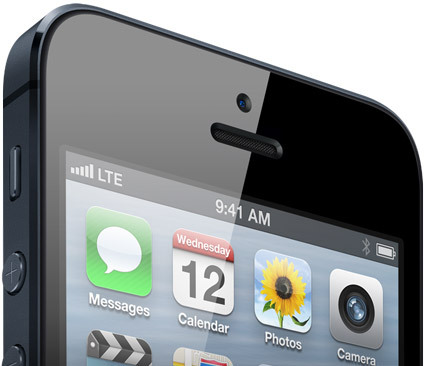 In a long past-due feature, iPhone 5 supports LTE, capability long available from Android and Windows Phone competitors. The new handset, Apple's sixth, will be available from AT&T, Sprint and Verizon in the United States -- but again, no T-Mobile. As rumored, Apple changed the dock connector, essentially making obsolete existing peripherals -- that is without some kind of adaptor. Emphasis is now more on wireless, such as Bluetooth audio (something Nokia gave me more than three years ago) and WiFi for streaming or syncing. iPhone 5 is constructed of glass and aluminium and like its predecessors will be available in black and white. The unveiling marked a big departure from Steve Jobs-era events. CEO Tim Cook announced iPhone near the front of today's media gala, putting it even ahead of iOS 6. Typically, Jobs saved the big thing for the end.